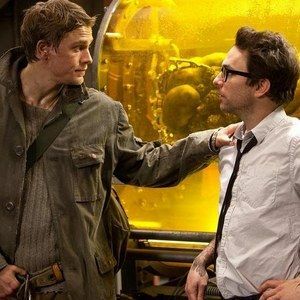 Charlie Hunnam and Charlie Day, best known for their roles on hit FX TV series Sons of Anarchy and It's Always Sunny in Philadelphia, are featured in the latest photos from Pacific Rim. Charlie Hunnam plays Raleigh Beckett, a Jaeger pilot forced to put his skills to the test, while Charlie Day plays scientist Dr. Newton Geizler, an expert on the kaiju monsters Raleigh must fight off on a daily basis. Check it out as they get a good look at one of the creature's enormous brains. Director Guillermo del Toro is also featured here,directing one of the giant mechanical Jaegers. Do these photos get you more excited for the July 12 release? Or do they make you yearn for a Sons of Anarchy/It's Always Sunny in Philadelphia spin-off?